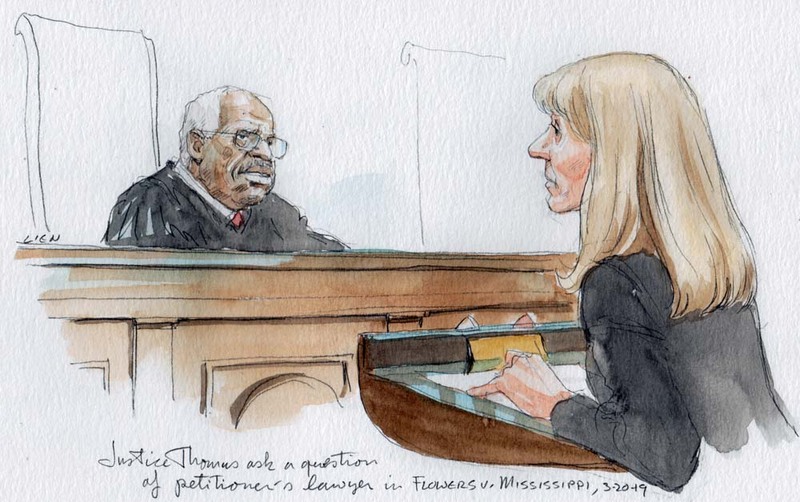 Today will bring an intense hour of argument about race in jury selection in the case of a Mississippi man who has been tried six times by the same prosecutor, which will culminate in a series of short questions by Justice Clarence Thomas, his first during oral argument in three years. But first, there are a couple of lighter moments. Chief Justice John Roberts announces that Justice Stephen Breyer has the court’s opinion in Obduskey v. McCarthy & Holthus LLP, interpreting a provision of the Fair Debt Collection Practices Act. Breyer has been busy at opinion time this week. On Tuesday, he delivered the first dissent from the bench of the term when he responded to Justice Samuel Alito’s majority opinion in Nielsen v. Preap, which gave the federal government greater authority to detain, without bond hearings, immigrants facing deportation who have committed crimes. Breyer spoke of the “basic promises” that the nation’s legal system offers all persons, including a bail hearing. Breyer also announced the judgment and delivered a plurality opinion yesterday in Washington State Department of Licensing v. Cougar Den Inc., about whether an 1855 treaty between the United States and the Yakama Nation tribe pre-empts a Washington state fuel tax as it applies to the tribe’s transport of fuel by public highway. Today, Breyer just has a straightforward announcement of a unanimous opinion in Obduskey, holding that a business engaged in no more than nonjudicial foreclosure proceedings is not a “debt collector” under the fair-debt law, with one exception. Justice Sonia Sotomayor has filed a concurrence. The chief justice then announces that the court is issuing a per curiam opinion in the argued case of Frank v. Gaos, a challenge to “cy pres” settlements in class actions in which the funds go to the lawyers and certain nonprofit organizations, while class members get nothing. Roberts begins a summary of the per curiam by explaining the underlying issue — that Google has allegedly violated the Stored Communications Act by transmitting search terms of the user to the server that hosts the selected web page. The chief justice explains that the class action applied to searches conducted by Google users from 2006 to 2014, “so that means most of you.” He gets a good chuckle from the courtroom. He goes on to explain the reason for the per curiam treatment today — that the solicitor general has raised concerns about whether any named plaintiff in the case actually had the right to sue, known as standing. The court is sending the case back for the district court and the U.S. Court of Appeals for the 9th Circuit to consider standing in light of the Supreme Court’s 2016 decision in Spokeo Inc. v. Robins. Thomas has filed a dissent. Next up is bar admissions. There are a few individuals and two groups today. One group is from the Los Angeles County District Attorney’s Office, whose members will certainly find the argument engaging. The other group is from the Western New England School of Law. The school official or alumnus who presents the group draws growing laughs as he introduces his son, his nephew, his cousin, then a few non-relatives, and then another son, who is a member of a different state bar than the first son. In his understated way, Roberts says, “Your motion is granted, and your relatives and the other applicants will be admitted.” This triggers a wave of laughter, and one person in the public gallery even claps at the quip. The chief justice — he’s here all week. But the mood quickly turns serious as Flowers v. Mississippi, the lone case for argument, begins. As Amy Howe reported in her argument preview, this case involves Mississippi death-row inmate Curtis Flowers, who has been tried six times for the 1996 murders of four people in a Winona, Mississippi, furniture store. Doug Evans, the local district attorney, served as the lead prosecutor at all six of the trials. In Flowers’ first two trials, which involved a single murder charge, Evans used his peremptory strikes to eliminate all 10 potential African-American jurors. Flowers was convicted and sentenced to death, but both convictions were later reversed by the Mississippi Supreme Court, which found that Evans had engaged in intentional misconduct, such as introducing evidence of the other murders. At his third trial, Flowers was convicted and sentenced to death for the murder of all four victims, as Howe wrote. But the Mississippi Supreme Court also overturned those convictions. Evans had used all 15 of his peremptory strikes to remove African-American members of the jury pool, the state court ruled, in violation of the U.S. Supreme Court’s 1986 decision in Batson v. Kentucky. When Flowers was tried a fourth time, Evans used 11 peremptory strikes to remove potential African-American jurors, resulting in a jury with seven whites and five African-Americans. That jury deadlocked, as did the jury in Flowers’ fifth trial, Howe noted. Evans used five peremptory strikes in that trial, but there is no record of the race of the jurors whom he struck. At Flowers’ sixth trial, in 2010, six of the 26 potential jurors in the jury pool were African-American. Evans allowed the first one to be seated but then struck the next five prospective African-American jurors, resulting in a jury of 11 white jurors and just one African-American. Flowers was convicted and sentenced to death for all four murders. That 2010 conviction was upheld by the Mississippi Supreme Court, and upheld again after it was remanded for reconsideration in light of the U.S. Supreme Court’s 2016 decision in Foster v. Chatman, which held that the use of peremptory strikes to remove potential African-American jurors, as reflected in prosecutors’ notes, was unconstitutional. This most recent conviction is the one before the justices today, and they will consider whether the state high court erred in how it applied Batson. She describes the numbers and some of the anomalies in the questioning and striking of potential African-American jurors, factual matters that will be batted around in great detail today. Alito interrupts her with a question that will help set the tone for the argument. But “if we were to disregard everything that happened before this trial, and we looked at the strikes of the black prospective jurors as we would in any other Batson case, do you think you’d have much chance of winning?” he says. The evidence is that Evans acted with discriminatory motivation, Johnson says. Alito, a former United States attorney for New Jersey, presses her on some of the relationships between many of the potential jurors and either the defendant or the victims. The argument will veer several times to the close-knit nature of small-town Winona, with a population of no more than 5,000. One prospective juror worked at the same retail store as the defendant’s father, or “the world’s smallest Walmart,” as the trial judge called it and Alito repeats in court. Yes, says Johnson, the Mississippi Supreme Court said that concern accounted for some of the differential questioning. Davis accepts that description, which appears to apply to numbers from the first five trials but not the sixth. The chief justice tries at various times to move the discussion toward a general principle. When Davis says no, the chief justice asks the question in a slightly different way, as if to make sure he is hearing the state’s lawyer correctly. “My point is, is there anything in our precedent that suggests that there ought to be a limitation on looking to the history of the prosecutor involved?” Davis stands by his concession. Sotomayor, a former assistant district attorney in Manhattan, tells Davis that she tried to conduct some research on formalized principles for when a particular prosecutor should no longer be the one to keep retrying a case. Not so fast. Someone has a further question. Thomas has been leaning forward as if he were itching to ask a question, but he does that from time to time and it is usually just a tease. “Ms. Johnson, did you — would you be kind enough to tell me whether or not you exercised any peremptories?” he says. “And what was the race of the jurors struck there?” continues Thomas, who was the lone dissenter in Foster v. Chatman. Sotomayor chimes in with some help, pointing out that the defendant’s lawyer didn’t have much opportunity to strike black jurors. Johnson decides that she will make a concluding statement after all. “When all of the evidence in this case is considered, just as in Foster versus Chatman, the conclusion that race was a substantial part of Evans’ motivation is inescapable, and the Mississippi Supreme Court’s conclusion to the contrary is clearly erroneous,” she says. And with that, the case is submitted.